DALLAS, TX – In case you missed the memo, between Friday 16th and Sunday 18th February, more than 50 of the most respected developers, entrepreneurs, venture capitalists, private investors, thought leaders, and even regulators are coming together at Dallas to give cryptocurrency enthusiasts and “average Joe” investors the inside scoop on where the smart crypto plays will be in 2018.
Who exactly will be speaking? James Altucher – A hedge fund manager, entrepreneur, best-selling author, venture capitalist, podcaster, and Bitcoin believer. He’s founded 20 companies including StockPickr, and he frequently contributes to TechCrunch, TheStreet, and the Financial Times. Now he’s got his finger on Bitcoin’s pulse, and you don’t want to miss what he’s going to reveal. Tim Draper – Tim is a venture capitalist, and his firm was one of the early investors in Skype, has his fingers in a lot of pies, including crypto and blockchain ventures. He’s going to show you where the smart money is. 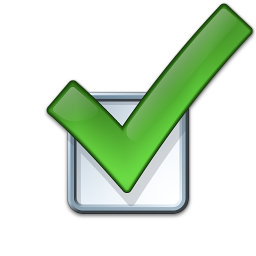 John McAfee – Yes, that McAfee. He’s the guy who created McAfee internet security. He also famously said he’d eat his you-know-what on live TV if Bitcoin didn’t reach $500k in three years. John’s going to show you why he’s not nervous about that at all. Ronnie Moas – Ronnie was a Wall Street money man, and he founded Standpoint Research. He and his team deliver stock analysis daily. When bitcoin was still a joke to most, Ronnie predicted it would hit $11k. Then $14k. Then $20k. Wait until you hear his next predictions. Erik Voorhees – Erik co-founded the bitcoin company Coinapult and is also the creator and CEO of ShapeShift.io, the instant bitcoin and altcoin exchange. He’s been a featured guest on Bloomberg, Fox Business, CNBC, BBC Radio, The Peter Schiff Show, and numerous industry conferences. Erik is no fan of the Feds or taxes and keeps his finances and assets in bitcoin. Charlie Shrem – Charlie has been featured in two Bitcoin documentaries: “The Rise and Rise of Bitcoin,” and “Banking on Bitcoin” and he has a lot to say about where the blockchain revolution is headed. Charlie is also the founder of the Bitcoin Foundation (Vice-Chairman 2012 to 2014) and worked on the standardization, protection, and promotion of Bitcoin. Lyn Ulbricht – Lyn is the mother of Ross Ulbricht. Ross was handed a double life sentence for creating the Silk Road marketplace. The problem is, they were all non-violent charges, and no victims came forward in any way. By contrast, Noriega got 25 years. Having seen her only son incarcerated for life after a trial rife with proven corruption, Lyn is dedicated to fighting not only for Ross’s freedom but for the thousands who have been victimized by our flawed criminal justice system and the drug war. She’ll be talking about Digital Privacy. 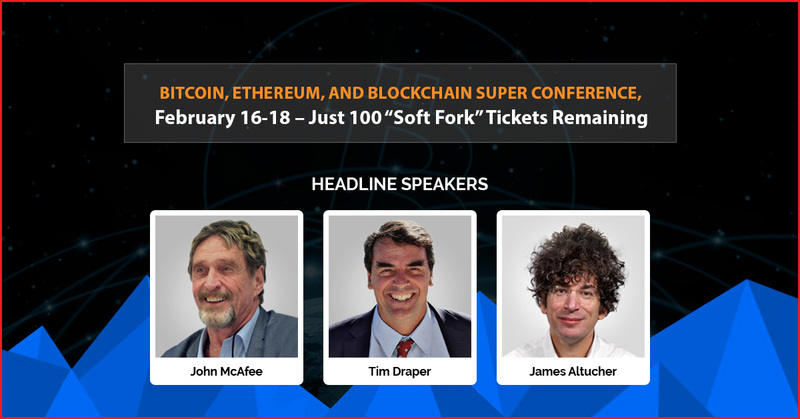 Tickets to the “main” Super Conference have completely sold out. However, Richard Jacobs, the organizer, has secured a second venue and is deploying a “soft fork” for around 300 new ticketholders. Live stream of the main conference – The second venue will be hooked up with state-of-the-art AV equipment, so attendees can take part in all of the keynote and other “main conference” talks while being able to interact with the speakers and ask questions. More surprises (details to be announced) – Mr. Jacobs is putting together a few surprise bonuses for everyone who registers as a “Soft Fork” attendee. 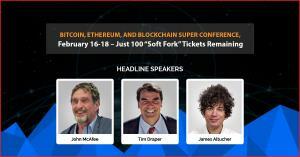 When this special “Soft Fork” opportunity was announced, more than 400 people had put their name on a waiting list for a chance to come to the Super Conference. As soon as tickets went on sale, within the first few days, more than 200 of them were snapped up – by eager crypto enthusiasts and private “average Joe” investors who want to seize this opportunity of a lifetime to get rich from rapid technological change that most ordinary people don’t yet see coming. If you want to be a part of this Super Conference too, then it is recommended that you get your ticket ASAP. Want to learn more about the conference? Join the free notification list over HERE.